Cadillac Escalade cabin air filter location. From year 1999, 2000, 2001, 2002. Here you can find how to locate Cadillac Escalade pollen filter when you need to replace. Where is located cabin air filter on a Cadillac Escalade. 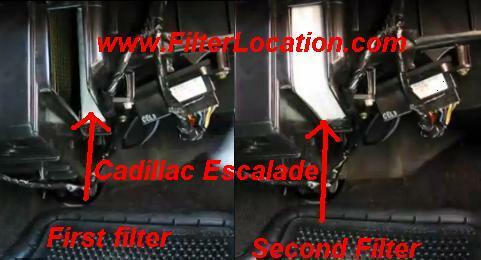 Cabin air filter on Cadillac Escalade is located inside the car on the passenger side, under the glove box. To have access and to replace the cabin air filter on a Cadillac Escalade follow the next instruction. See picture to see where your cabin air filter is located. To access and replace the cabin air filter you need to remove the bolt or screw that secure the cabin air filter housing cover. Is possible some models have a plastic panel that must be removed to access this area. The housing contains two filter installed side by side. Pull first filter straight down to removing for the housing. Slide the second filter to first filter location and follow the same procedure to remove from housing. Install the new filter, insert first cabin air filter and slide to front of the car an second pull up straight. Both filters must be installed with the air flow arrow point to driver side of vehicle. Put back the filter housing cover panel and the bolt or screw that secure the filter hosing cover. For more guidance feel free to ask about how to replace the air conditioning filter for Cadillac Escalade. Find more information about where is located cabin air filter or air conditioning filter for Cadillac. If you want to reset service light reminder on Cadillac Escalade click here. 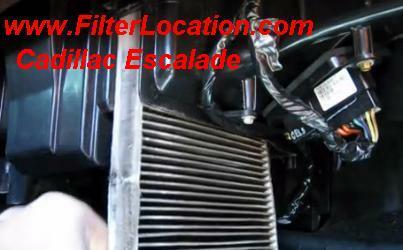 How to locate if you need to change cabin air filter, oil filter, fuel filter, pollen filter, dust filter or air filter on Cadillac Escalade. I took out four screws from the plastic housing on my 2000 escalade to get to the cabin air filter but could not get the cover to come off. All of the videos I hav seen the cover falls off after screws are removed. I did not want to break the cover am I doing something wrong or do I need to force it off? Hi. First try to check if there is anything else left that held the kick panel. Then you can try to gentle remove it. Be careful not to break it. Try very gently and if you can’t do it, is better to stop. Sorry for not being more helpful, but I will look for more information about it. 1999 Escalade is completely different. Managed to get off the bottom housing (no kick panel) and found the AC evaporator at an angle. No apparent filters at all.